History has not been kind to the legacy of Florida’s Confederate soldiers. Too often they appear as little more than a footnote in accounts of the American Civil War. Nevertheless, Florida troops were present at Gettysburg and they fought bravely alongside their comrades from Alabama and Georgia on July 2 and 3, 1863. Florida was represented at Gettysburg by a brigade of three infantry regiments in Major General R. H. Anderson’s Division of A. P. Hill’s III Army Corps. By the summer of 1863, these soldiers were seasoned veterans of the Army of Northern Virginia. The 2nd Florida Infantry had experienced heavy combat in several battles during the Peninsula Campaign of 1862 (aka Peninsular Campaign). The regiment fought at Yorktown, followed by a delaying action at Williamsburg where the regiment's first colonel was killed. At a swampy Virginia crossroads called Seven Pines, the 2nd, then attached to Brigadier General Samuel Garland's brigade, fought a brutal contest through mud, heavy vegetation and waist deep water. There, the 2nd Florida gained everlasting glory when it charged and captured a battery of Federal artillery while sustaining over 50% casualties. After the Seven Days Battles, the battered 2nd was joined by the 5th and 8th Florida Infantry regiments. The Floridians bravely fought at Second Manassas, Sharpsburg, Fredericksburg and Chancellorsville, and continually proved themselves to be tough soldiers full of courage and fight. Following the battle of Sharpsburg, Maryland, in September 1862, the three regiments were consolidated into a single Florida brigade under Brigadier General Edward Aylesworth Perry of Pensacola. General Perry was stricken with typhoid fever at the time of the Gettysburg Campaign. 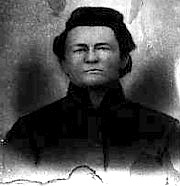 Brigade command devolved to Colonel David Lang of the 8th Florida Regiment. Colonel Lang was known for his bravery and had displayed valor at the Battle of Fredericksburg. On December 11, 1862, Lang and three companies of the 8th were attached to Brigadier General William Barksdale’s Mississippi Brigade. Barksdale was charged with occupying the town and delaying the Federal army’s crossing of the Rappahannock River. Meanwhile, the rest of the Army of Northern Virginia dug in on the high ground outside of town. Lang and his troops soon found themselves sniping at Federal engineers constructing pontoon bridges across the river to Fredericksburg’s City Dock. Despite severe Union artillery fire from the opposite bank, Lang’s soldiers continued to blaze away at the bridge builders and repeatedly drove them from their work. Union fire increased, and after a time a shell struck a nearby chimney and a large chunk of masonry gravely wounded Colonel Lang in the head. Still, Lang's men held their ground stubbornly – perhaps too stubbornly. When the order to fall back arrived, the Federals were upon them and most of the Florida detachment became prisoners of war. The charge of Perry and Wilcox on July 2 at Gettysburg. (Right) Photograph of 1st Lt. George D. Raysor, Co. G, 5th Florida Infantry. Courtesy Gettysburg NMP. The 19th Maine had been directly placed in position on Cemetery Ridge by none other than Union Major General Winfield Scott Hancock, commander of the Federal II Corps. Colonel Francis Heath had his men lie down flat on the ground to avoid exposing them needlessly to Confederate artillery fire. When the Floridians advanced across the Emmitsburg Road they repulsed a mob of fleeing soldiers from Humphrey’s Division, which was directly in front of them. These panicked-stricken soldiers ran over top of Colonel Heath’s regiment and attempted to rally in its rear. In the meantime, Heath waited until the Floridian’s line of battle was well within effective musket range and then he ordered his 400 Mainers to stand and fire. He gave specific orders for his men to shoot the color bearer of one of the Florida regiments who was advancing in front of his brigade and seemed to be guiding it. The color bearer was so close that Colonel Heath could plainly distinguish the young man’s features; years later Heath recalled the determined look in the color bearer's eyes. His men fired and the colors went down. The Floridians halted and the two lines of battle exchanged volleys at a range of less than fifty yards. By this time, the Confederate ranks were thin. The brigade had advanced almost a mile from its starting position in Spangler’s Woods. It has advanced under punishing artillery fire while pushing back several lines of blue-clad infantry. Lang's regiments had sustained heavy losses, with many company commanders killed or seriously wounded, and the entire color guard of its center regiment, the 8th Florida, casualties. The next day General Lee planned to attack again. This time, he would head straight for the Union center ("The Angle"), which he felt might be weak because the Federals had moved troops to re-enforce the flanks of their line. Major General George E. Pickett's all-Virginia division spearheaded the main assault. Attached to Wilcox’s Brigade, Lang's command was to advance as supports to Pickett's column. At about 1:00 P.M., the great cannonade intended to soften up the Federal center began. The Floridians were forced to lay prostrate for hours under the hot summer sun, surrounded by booming artillery pieces, while tons of lead flew through the air only inches above their heads. At last, the artillery fire slackened and the Virginians advanced, over Lang’s prostrate men, disappearing into the noise, smoke and fight on Cemetery Ridge. (Left) Picture of Archibald Graham Morrison, Co. D, 2nd Florida Infantry. Courtesy Gettysburg NMP. Among those Floridians captured at Gettysburg was Lewis Powell of Company I, 2nd Florida Infantry. Powell was wounded in the hand and exchanged later in the war. He joined the famous 53rd Virginia Cavalry, Mosby’s Partisan Rangers, and served for a time in the Shenandoah Valley. He then left the army and moved to Baltimore, Maryland. There he assumed the name Lewis Paine and took his place in history with the likes of Mary Surratt and John Wilkes Booth as a member of the Lincoln assassination conspiracy. On the night of April 14, 1865, Paine viciously attacked U.S. Secretary of State William Seward. Paine had rushed into Seward's home and stabbed the secretary repeatedly as he lay sick in his bed. Seward survived though the attack left him terribly scarred. Paine tried to escape but was caught, tried for his part in the conspiracy and hanged on July 7, 1865. After his execution, no relatives arrived to claim his body. In 1992, his skull surfaced at the Smithsonian Institution in Washington, D.C., and was released to a descendant in 1994. It was buried next to the grave of his mother in Live Oak, Florida. Two brothers, Francis and C. Seton Fleming, were members of the 2nd Florida Infantry. So many officers in the 2nd became casualties at Gettysburg that by the end of the battle Seton, a captain, commanded the regiment. Seton was also one of the bravest and most popular members of the regiment. He was killed the following year at Cold Harbor while attempting to carry out a suicidal order to counter-charge. After the war, Francis served as Governor of Florida (as did Brigadier General E. A. Perry, who returned to lead his brigade after Gettysburg) and wrote a memoir about Seton recounting their service in the 2nd. After Appomattox, Colonel Lang became a civil engineer and worked closely with Governors Perry and Fleming in the 1880s. Lang and two other officers from Perry’s Brigade returned to Gettysburg in the 1890s and staked out the positions where the Floridians had fought. They marveled over the fact that any of them had survived after advancing so far against such heavy artillery and musket fire. 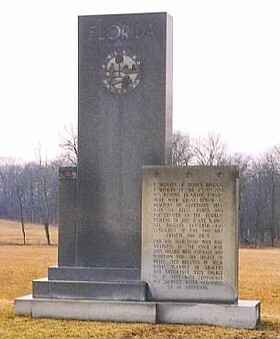 Soon after, several tablets representing Perry’s Brigade’s participation in the battle were erected on the battlefield by the United States War Department. See also Florida Civil War History. On July 3, 1963, Florida Congressman Sam Gibbons dedicated the Florida Monument on West Confederate Avenue. The monument features a simple design of three gray granite monoliths, emblazoned with the state seal, brief narrative, and three stars. Each star represents one of the Florida regiments of Perry's Brigade that fought at Gettysburg. The monument is located near the site where Perry's Brigade arranged their battle lines prior to the charges of July 2 and 3, 1863. Credits: Jim Studnicki; Gettysburg National Military Park; National Park Service. 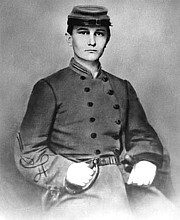 Traditionally the Florida Brigade has consisted of the 2nd, 5th, and 8th Infantry Regiments and was led by Edward A. Perry (thus Perry's Brigade). Three other regiments (9th, 10th, and 11th) were added later in the war. As the war progressed the brigade was at times led by Col. David Lang and later, on a permanent basis, by Brigadier General Joseph Finegan. The very end of the war saw T.W. Brevard promoted to Brigadier General. Brevard was commanding at the surrender at Appomattox. Perry's Brigade was at many of the major battles of the war though they did not participate in all of them. Floridians suffered major losses at battles such as Seven Pines, Sharpsburg, Gettysburg (they took part in Pickett's Charge), The Wilderness, and Cold Harbor. In addition to battlefield casualties the brigade had major issues with sickness and desertion which became more problematic as the war progressed. Sickness during the siege at Petersburg became rampant as poor rations, poor living conditions (including filth and vermin), and bad weather took their toll. The winter of 1864 prompted Dr. Thomas Palmer to ask that the Florida troops be sent home as they were unaccustomed to such conditions. His request was of course denied. Desertion, or French leave as Waters and Edmonds call it, became a problem for the Confederacy as a whole but a major issue for the Florida brigade. While the above mentioned rations and living conditions played a major part in why men left there were other reasons as well. While a general sense of hopelessness was beginning to take over Waters and Edmonds argue that the home front played a larger part in desertions. While morale was low on the field it was even lower at home. Letters from home described the difficulties those left behind were suffering. Many men were torn between their duty as soldiers and their duty as husbands and fathers. Often being a family man prevailed. It is also argued that a lack of strong command help push men to leave. In the Florida brigade under Finegan many officer positions went unfilled due to both lack of qualified men and also Finegan's failings. Those higher up also must share blame. By not being able to provide food, clothing, and pay to the soldiers the Confederate government must be held accountable. Waters and Edmonds have shown that the men from Florida who fought in the Civil War were neither cowards nor were they the major leaders. These were average men fighting for what they believed in. All they asked in return was to be treated fairly by their government. Unfortunately issues beyond their control did not allow this to happen. While many deserted the large majority remained and ultimately surrendered their weapons at Appomattox, effectively signalling the end of the war. Waters and Edmonds have written a much needed work and they are to be commended for the effort. The lack of and difficulty in finding Florida material makes this book an achievement to be respected. The notes section runs over 30 pages and contains much valuable information. The bibliography will no doubt be relied upon by generations of future researchers. There are some areas I feel improvements could be made however. As I have seen other reviewers say more maps could be added. This is a consistent gripe with almost every book however. Cartographers could make a living just off of Civil War books with the way we want maps. While overall the writing is good I found myself confused regarding the Siege of Petersburg and what transpired. I don't know much about this though so it could just be my lack of knowledge of the subject. 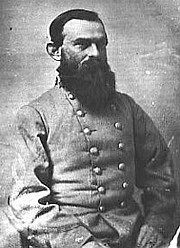 Col. David Lang played a vital role in Perry's Brigade and I would have like to have had more information on him and also on how and why T. W. Brevard was appointed Brigadier General over him. A Small But Spartan Band has earned it's place amongst the important works on Florida during the Civil War. I do not believe this to be the final or ultimately most authoritative work we will see however. That being said based upon what I have seen this is the leader and future authors will rely on the research Waters and Edmonds have done. Recommended! Although the smallest in terms of population, Florida sent over 15,000 men to the Confederate army, and Florida regiments served in both the eastern and western theaters of war. They gave valiant service in battles from Shiloh to Chickamauga and from Antietam to Gettysburg. Such fighting decimated the ranks of Florida units and caused anguish for those left behind at home. These home front Floridians: women, slaves, Seminoles, and Hispanics, shouldered the heavy burdens of keeping families together and supplied with food. Their story of silent heroism and contributions to the rebel war effort are too often overlooked. And while the names of such Florida figures as John Milton, Pleasants W. White, Jacob Summerlin, or J.J. Dickison seldom appear in larger histories of the war, it was because of their efforts that Tallahassee was the only state capital east of the Mississippi River to escape Union occupation during the course of the war. Recommended Reading: Discovering the Civil War in Florida: A Reader and Guide. Description: Discovering the Civil War in Florida includes readings and a travel guide. The Civil War in Florida may not have been the scene for the decisive battles everyone remembers, but Florida played a crucial role. While Confederates fought to preserve their sovereignty and way of life, Union troops descended on Florida with a three-part mission to cripple the Confederacy: to destroy seashore salt works, to prevent the transfer of supplies and raw materials into and out of the state, and to seize slaves and cattle. Continued below. Union soldiers skirmished with the famous, or infamous, Confederate Cavalry Captain John J. Dickison, who held his ground in Florida using guerrilla tactics. Mayor C. Bravo hoisted a white flag at Fort Marion and then personally met Commander C. R. Rogers at the dock to surrender St. Augustine to the Union in 1862. Discovering the Civil War in Florida chronicles Civil War activity in thirteen Florida towns, exploring both land and sea maneuvers. Maps showing the major skirmishes in each geographical area, as well as railroads that existed at the time, highlight the text. Sprinkled throughout are photos from the state archives and woodcut illustrations from books written during or soon after the war. For each town, the author has included excerpts from official government reports by officers on both sides of the battle lines as well as excerpts from other sources, including first-hand reports of the death and destruction soldiers brought to Florida’s sparsely populated towns. You can visit Civil War sites in Florida today. Others are places where only battlefield sites and memorials remain. Read a short history of each site and find out about amenities, directions, hours, and admission fees. Recommended Reading: Blockaders, Refugees, and Contrabands: Civil War on Florida's Gulf Coast, 1861-1865. Description: "[Buker] argues that the presence of Union sailors and their extensive contacts ashore did serious damage to home-front morale and retarded Florida's value as a component of the rebel war machine. Since the state's long coastlines made it a ready target for a naval cordon, its commercial life suffered beginning in 1861 and deteriorated even further as the war progressed despite the efforts of blockade runners. Continued below. As every American knows, the result was a long, bloody and costly war that produced many changes in the political and economic climate of the United States. Pitting brother against brother, state against state and ideology against ideology, the war swept aside the dominance of agrarian Americans and ushered in a new era controlled by industrialists and bankers. Florida, and her fellow southern states, was left to the task of picking up the pieces of its culture, bolstered by a persistent and unflagging mentality of what should have been. It has literally taken more than a century-and-a-half for the open wounds of defeat to heal. Dr. I. D. S. Winsboro of Florida Gulf Coast University in Fort Meyers is the editor of the first Gold Seal volume. His scholarship on the role that African-Americans played in the Civil War is well known. Once again, welcome to the inaugural volume.